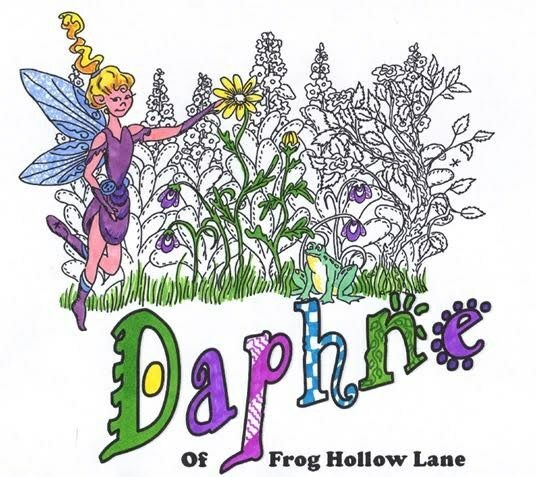 Kathleen Godwin of Reading and Karen Black of Dushore are hoping to raise enough funds to publish the “Daphne of Frog Hollow Lane Coloring Book.” They hope to bring Daphne’s joy and brightness to the world by publishing an adult coloring book featuring her adventures with her friends. They hope many will be blessed with her whimsical charm while relieving daily stress. Creativity has always played a central role in Kathleen’s life. A child of Swedish immigrants, she grew up immersed in the arts: language, dance, drama, music and singing. Along with her two sisters, she performed as “The Jonsson Sisters” throughout her childhood and into her teens, until they moved away from the New Jersey/New York market into the quiet and beautiful hills of Northeastern Pennsylvania. In college, Kathleen fell in love with a brilliantly creative Irishman, who she married in 1977. Daphne was born of his imagination one memorable evening, and her subsequent, sporadic appearances throughout their marriage were always joyful, sometimes hilariously funny, occasionally bittersweet, and unfailingly appreciated. Those 31 years were also filled with family, work, theater, dance, music and song – all the things that make a person happy. Then a series of lucky events led to Kathleen’s creation of Arts YOUniverse in 2004, where she met Karen Black. They kept in touch even after Kathleen became a widow, closed the business and moved away. Kathleen now lives and works in Southeastern Pennsylvania, married artist John Pacovsky, and still enjoys theater, music, song and dance. Kathleen is thrilled to introduce the world to Daphne through the talented artistic vision and creative hands of Karen Black. 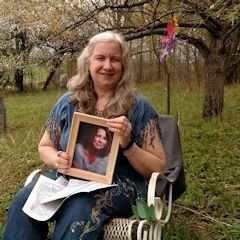 Karen Black is an artist and author in Sullivan County. Although self-taught during childhood, Karen received training from Master Instructors from Society of Decorative Painting and a private Atelier. Karen specializes in murals, miniatures, and commissions of all sorts, and writing historical non-fiction. She loves the challenges of various mediums and venues. 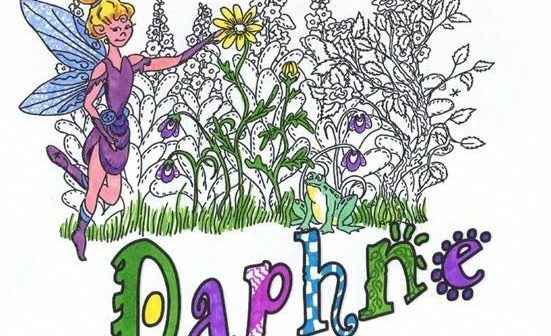 By creating an adult coloring book, the two women hope to share with as many people as possible Daphne’s joy and fun and help bring stress relief in this hectic world. Once the book is colored, it can be used as a story book. Imagine a storybook that you colored yourself! How fun! You can enjoy it again and again The publication of Daphne would mean so much to both. To see an idea from a creative mind and make it visually enjoyable for young and old is an honor beyond compare. They hope this whimsical house fairy brings a smile to anyone who colors in her book. Karen has published coloring books before through private funding, and they have been well received by their target audiences. Creating an IndieGoGo campaign is new to both women and very exciting. “IndieGoGo seems a great way to continue sharing my artistic and creative books with the world,” says Karen. How does IndieGoGoLol work? It’s a crowd source funding. A person can donate directly or buy a Perk which is like a pre-purchase of a signed coloring book, plus other options. Kathleen and Karen need $500 to print the minimum of 250 coloring books. Daphne will be 34 pages of fun and adventure to color. It’s a meager sum, but they are hoping to spread the joy of Daphne’s world to a much larger audience. Perks are $15 , plus shipping. With a $15 donation, you will receive a personalized copy of Daphne’s Coloring Book. Karen will sign the inside cover with a personal message. For $20, plus shipping, you will receive your personalized copy of Daphne’s coloring book plus an exclusive 4-pack of Postcard Prints of Karen’s work. You will be able to choose your set of postcards.